I'm not going to explain why you would play a monk, or what the role of a monk is. This is just about the choices for a monk, and made for people who already decided that they're going to play a monk. Black This is decent, it's not optimal but you’re not hindering your character picking this. Purple Maybe sometimes useful, but very often you're wasting valuable character growth. Red Just nope. There’s either something strictly better or it’s a downright awful pick. CON Hit points and constitution saving throws are both important, but constitution is for a monk less important than wisdom or dexterity, don't overrate it. INT The dump stat in 5e, maybe you want it higher than strength but if you have a wizard or other high int character there's no reason for that. WIS Very important for AC and DCs, it has to reach 18 or 20 at higher levels. Hilldwarf Put a 14 in CON and never look back. +1 wisdom is also very nice. If you begin at higher levels this becomes sky blue, but you really need a DEX of 16. Moutaindwarf +2 constitution and +2 strength isn't that bad, but with low wisdom and dexterity you won't be a really good monk. Wood elf +2 Dex and +1 Wis, oh yeah, extra speed is nice. In addition, the basic elf features and Mask of the Wild which is very useful. Drow A high elf with sunlight sensitivity. Stout halfling Good bonuses, lucky, brave. The low speed becomes less of a problem later. Lightfoot halfling Close to blue, you have all the nice halfling features and +2 dex, but you're not way better than a high elf. Human Boring but useful, you can have 16 dex, 16 wis, 14 con at first level and you don't have to dump the other stats that hard. Variant human 16 dexterity, 16 wisdom and a feat... A perfect race, as monks are pretty MAD andyou need every ASI in wisdom or dexterity (maybe one in CON), now you can also have a feat. Your best option. Dragonborn You have a breath weapon and a resistance, that's all. Rock gnome As I said before, dexterity and wisdom are very important for monks. The spell advantage is nice but not enough to warrant picking this race. Forest gnome With +1 dex, you can have a solid monk. This is almost blue, and you still have the spell advantage. Half-elf The +1 wisdom and +1 dexterity are nice. Half-elf is a good choice for everybody. Close to blue, but it's still just decent. Half-orc +1 constitution and some other features. Not red but not even close to black. Tiefling Useless ability bonuses and magic reliant on your dump stat. Aarakocra Flying speed, Dexterity, wisdom, this is sky blue and nothing less. Deep Gnome Not that different from forest gnomes. Air genasi Not bad, this is good for most monks, and it's the only genasi with a DEX bonus. Earth genasi A sneaky mountain dwarf. Fire genasi Inteligence is your dump stat, don't take this subrace. Water genasi The constitution and wisdom bonuses make up for your lack of dexterity. This becomes blue if you start at a higher level. Goliath A bad half-orc. Don't take it. Acolyte Typical monk proficiencies but religion isn't a great skill, insight is still useful. Charlatan You don't need sleight of hand or deception. Criminal Stealth is very useful and makes this way better than charlatan. The tool proficiencies, however, aren't that good. Entertainer Acrobatics is nice, disguise kit isn't bad either. However, performance and an instrument aren't what you need. Folk hero Two wisdom skills and average tool proficiencies, close to blue. Guild artisan You don't need persuasion, but all other things this gives you are good to have. Hermit Typical monk, medicine and the discovery feature are both useful. Noble History, Persuasion, a gaming set? Not what you're looking for. Outlander Everyone likes athletics, and I'm sure you'll find some uses for Survival. A good feature and decent equipment make this a good choice. Sage Even worse than noble. Sailor Great skills and a great feature. The best background for most classes, and that includes monk. Soldier Decent. Not a lot more to say here. Urchin The skills might not be required often, but at least they use dexterity. If your party lacks a rogue, consider this. Unarmored defense You can't use armor or shields, so this is a great thing to have. Not gold because a level in barbarian/dragon sorcerer would give you about the same. Martial arts The reason you are a monk. Ki Without this, you are a fighter with bad damage output. With it, you are a monk. Unarmored movement Improved mobility. Not a lot else to say. Deflect missiles This will only apply in certain situations, but when it does you'll be thankful you have it. Ability score improvement Monks are MAD, so ASI's are good. Extra attack As expected for a martial class. Stunning strike Stunning can be quite powerful, but note it'll cost you a lot of ki points. By the time enemies are getting legendary resistance and high CON saves, this becomes a bit worse. Note that you can apply this on all attacks you make in a round. Ki-Empowered Strikes Pretty much required to have if you want to remain useful in combat. In a campaign without magic items, this becomes even better. Evasion I'm pretty sure I don't have to say how useful this can be. Stillness of mind Charmed and Frightened aren't too uncommon effects. Being able to remove them is good, although it costs you an action. Purity of Body Poison is common, but you'll still not use this 90% of the time. Tongue of the Sun and Moon A social ability, which gives you some out-of-combat versatility. It won't safe your life, but it can make certain encounters far easier. Diamond soul Rerolling (death) saving throws is great on its own. Proficiency in all saving throws on top of that? This is great, and nothing else. Timeless body If you are still worried about starving to death at this level, something has gone wrong. The other features are mere fluff. Empty Body Astral projection on yourself only isn't what I'd exactly call useful. The other feature is great, though. Even against enemies with truesight this is sky blue. Perfect self Not that great compared to some other level 20 features (druid, barbarian). Way of the Open Hand Best of the three, this makes you more effective in combat than any other monk. Open hand technique Simply amazing. Wholeness of body Free healing, but it costs an action. Tranquility Nearly unusable. A level one spell you cannot even control? Awful. Quivering Palm This is simply wonderful. It amounts to a save-or-die, which 5e doesn't have many of. Way of the Shadow Not bad, if you have/want a stealthy party this is something for you. Shadow step and Opportunist both make you stronger in combat. Shadow Arts More and better spells than the elemental monk. Shadow Step This must be the best feature of this tradition. Cloak of Shadows A surprise attack. It is nice, but nothing more. Opportunist Who doesn't like free damage? Way of the Four Elements Spellcasting from a rather limited list, and it consumes the ki points you badly need. Breath of Winter Your normal attacks do more damage and don't cost ki points. Clench of the North Wind Stunning strike is better. Elemental Attunement This is better than it appears to be. A lot can be done with this power. Note that you can technically swap it out at a higher level. Eternal Mountain Defense Not too bad, but from level 18 on Empty Body is better. Fangs of the fire snake Good damage, and the extra reach opens up hit-and-run tactics. You could pick worse. Fist of Four Thunders Battlefield control is good. Open Hand is better at throwing a single person around, though. Fist of Unbroken Air Just attack, you'll do more damage. Flames of the Phoenix Fireball is a good spell, but you don't need more ways to deal damage that badly. Mist Stance Both out-of-combat and in-combat use. Ride the Wind Mobility is good. This spell gives mobility. This spell is good. River of Hungry Flame Lots of uses, depends on your creativity. Shape the Flowing River Depends on how much your DM is willing to let slide. Sweeping Cinder Strike This is simply awful. Water Whip Errata turned this into an action, making it worthless. Wave of Rolling Earth Just like wall of fire, this can be used in many ways. Barbarian Extra rage damage and unarmored defense are useless, but rage gives other benefits, and Reckless Attack is pretty neat. Cleric You already have good wisdom, and many of the domains have attractive powers. Druid Druid/Monk is a well-known multiclass. Extra AC while wildshaping and spells, and all you need are stats you'd boost anyway? Better than cleric, except for a one-level dip. Some options with the wild shape won't work, ask your DM before you go for Druid, maybe you DM says you don't get the extra AC (or attacks/spells). Fighter One or two levels in fighter rarely hurt. Paladin Maybe take two levels so that you get LoH and Divine Smite. Ranger Ignore the stat matchups; this is a bad multiclass. Rogue Shadow monk mixes nice with rogue. Sorcerer Why would you do this? Warlock This rating might come as a surprise, but truth is bladelock/monk builds can get rather interesting. There are still better options, though. Healer If there isn't a healing bard/cleric/druid/paladin this becomes blue. This feat isn't bad at all. Inspiring Leader with a high charisma this feat isn't as bad as most feats, with a charisma of 13 or lower you really can't use this. Mage Slayer Depending on campaign, but now you have good defenses against spellcasters. In melee you are already a boss and against archers you have deflect missiles. Magic Initiate Maybe for hex, but magic initate is a little bit UP feat. Observant +1 wisdom and other good abilities, nice for an odd stat in wisdom. Shield Master A shield? For monks? Thanks to Dire_Stirge for helping me out with this guide! Last edited by PoeticDwarf; 2016-03-11 at 06:02 AM. A (small) part of my Homebrew! And a guide! A subclass for me by Ninja_Prawn. You suggest going with variant human as a race, but do not offer a guide to feats that you feel helpful. Would you mind putting that in? I would be willing to help, of course, should you require it. Stupid that I forgot the High Elf, I will put him in later. I will also put the feats in. Thank you for the suggestion, I completely forgot it. Last edited by PoeticDwarf; 2015-07-28 at 06:55 AM. You advise monk/druid as a multiclass, mostly for the unarmed defense + wildshape combo. As a DM, I do not permit this combo, because it's not 'realistic'. I believe many others agree with me. Therefore, I would add a note to the guide saying "check with your DM before trying this." Personally, I'd add a health warning at the top of the multiclassing section, saying that monks generally prefer to be pure monks, due to ki progression & action economy. Only MC if you've got a specific goal in mind. Warlock, for 2 levels is pretty optimal for a shadow monk as devil's sight is nearly the only way to see through your own magical darkness. I will add it, but still is the druid dip with two levels or more better than, say, cleric. Or any other spellcaster. 1) While indeed the Elements Way is lackluster compared to others, I do not follow you on the water whip rating. Yes, it's now an action, and it's a real pain. Still, for a pure Elements Monk it's AFAIK the only way to do nova damage since there is no limit to Ki points you can pour in. Also, it can be useful for tactical positioning (draw an enemy to disclose a squishy ally, or bring him into range for stunning strike or ally's next turn). So it should be at least same rating as Fangs of Fire Snake imo. 2) Cleric should be same rated as Druid. Sure they do not offer the same kind of benefits, but you could also cast spells such as Spirit Guardians to break additional havoc since you're always good in melee. there's a little table in the elemental monk that tells you what your maximum allowed points are. AFAIK, the limitation only concern "monk spellcasting". don ’t need to provide material com pon en ts for it. spell (the disciplin e’s ba se cost o f 2 ki points plus 1). S p ells and Ki Points table. Sure, pouring all your Ki points in a single attack isn't the best way to use them, but it still means Monk can have a decent burst damage. Since I'm here, about Cleric. - Light domain: a useful cantrip and nice spells to complement Monk offensive abilities (especially Faerie Fire to get advantage at lvl1). Warding Flare is dispensable for a Monk though. - Nature: another way to get Shillelagh, Magic Resistance at lvl 6 is nice for anyone as a reaction (although a bit redundant with Evasion). - Tempest: not much synergy, but noted for Thunderwave that can provide a quick escape. - Trickery: nice spells to have (Mirror Image! ), CD can be useful (at least for providing advantage). Lvl6 Invisibility for some builds. - War: for CD and spells, need at least 5lvl to be good (since you cannot cast Magic Weapon on your fists). Water whip isn't enough. Monks already can go nova with stunning strike. Spending way too many points for 10d10 damage isn't worth it. I agree druid is normal black, but sone DMs allow wild shape/martial arts. The reason druid is blue. I'd add a message: black if your DM doesn't allow the wild shape martial arts combo and/or the unarmed defense wild shape combo. Once a player almost fell into a trap full of spikes. He asked me "how much damage would a spike do?" Then, he grabbed a spike and used it as a weapon for the rest of the adventure. I already added some DMs don't allow it. It's logical it becomes a worse choice if a DM doesn't allow it, right? Hi EnderDwarf! Big monk fan, quickly found your writeup while searching for monk goods. Sorry for resurrecting a 9 month old thread, but I had a question about your monk character creation guide, since I am going to take part in a DnD-game soon and want to make a good monk. I read nothing about a +1 wisdom bonus on that page, and the -2 constitution penalty is kind of a hazard for a monk, is it not? I tried looking at other places for Wood Elf info(dnd-wiki dot org, dungeons dot wikia dot com, etc) they all use the same stats, it seems. So how is it? Are wood elves really one of the best choices for monk, if they don't get +1WIS and they instead get -2CON...? Also, you commented on the wood elf that "Extra speed is nice", where does the extra speed come from? I thought wood elves had 30feet speed, like all other medium creatures? Last edited by Aell; 2016-03-09 at 09:59 AM. That's a 3.x wood elf. The 5E WElf is as described by EnderDwarf. You note that you should consider an urchin background if your party lacks a rogue. Why wouldn't you also consider the criminal background for the same reasons? Furthermore, you get proficiency with thieves' tools, which should make the monk an even better stopgap rogue. Oh wow, so all those different wikis about DnD (I count five total) are using old figures?!?! I humbly stand corrected then, and this is very good news. Thanks! Suggest you read the Player's Handbook for D&D Fifth Edition. (5e) That wiki page is obviously not referring to 5e. +2 dexterity is for all elves. +1 Wisdom is unique to wood elves. There is no negative/penalty for Int, nor for constitution, in 5e for the wood elf. Best wishes. If you don't have the book, borrow the PHB from a friend and read up on races, classes, etcetera. Last edited by KorvinStarmast; 2016-03-09 at 10:17 AM. Stunning fist and diamond soul need to be gold. No other color will do. Proficiency in 4 saves and rerolls? The classes key ability in stunning fist? These abilities are worth 4 feats each. I would rather have each than 4 feats or ASI. I agree on Diamond Soul, but do you mean Stunning Strike? The hitch is the Con save. A lot of monsters have + to con. Is the DC based on the Monk's dex, wis, or what? Starting at 5th level, you can interfere with the flowWhen you hit another creature with a melee weapon attack, you can spend 1 ki point to attempt a stunning strike. The target must succeed on a Constitution saving throw or be stunned until the end of your next turn. Was that covered in an errata or sage advice, or is it like the con save for concentration, 10 or half damage, whichever is greater? Con save DC is based on your Wisdom. 8 + Proficiency + Wisdom bonus. It's right there in the PHB. Hmm, I see, it's based on being a Ki ability. My brain was parsing it as a form of attack/melee attack, which was the wrong way to look at it. Thank you. Diamond soul is extremely powerful if you'd get it earlier, now it is in my opinion still very powerful, but saves just aren't THAT important anymore (they still are). Stunning strike is really nice but as mentioned below, the con save is what this makes worse. It eats your Ki and playing a high level monk myself, later you can't use it often because of the legendary resistance. I think the both are close to gold, but I'm not too sure if they really are gold. Also, the reason it is pretty strange DMs don't allow it in my opinion is that it works raw and it is logical. I mean, you keep the same mental stats in wildshape but your brains trains, so it all has to be MAGIC ! I would even let dragonbreath work in wildshape, it is as logical as the same inteligence. But as you know, I changed it, and although I think it is pretty strange I know most DMs won't allow parts of it. Agreed about Diamond Soul due to it's high level requirement. Completely disagree about Stunning Fist. It is probably the single best melee class feature in the game. Con save isn't great, but it isn't bad either. Why? Because you're essentially forcing disadvantage on each save by spending at least 2 Ki points and forcing them to roll multiple times until success. Also, it is the BEST ability BECAUSE of Legendary Resist. No DM on the planet is going to let their BBEG lose an entire turn (and generate advantage to hit/auto fail dex saves) so they are 100% going to use LR against any failed Stunning Fist. Blow a few Ki points to drain a BBEG's LR practically in 1 turn? That is massively powerful, especially considering that by RAW/RAI it is NOT a magical attack, thus they don't get advantage on their roll against it, unlike all the other spell effects. Oh, and they recharge on a short rest, aka every 2-3 combat encounters. By T3/4 gameplay that means you're never running out for all practical purposes. So one guy says they should both be gold. I think they both shouldn't. Above someone says only diamond soul should be gold and you say only stunning strike should be gold ? I agree; at higher levels, stunning strike is pretty much a waste of your ki (unless you can somehow inhibit your opponent's ability to roll absurdly well on the save). Even then, though, legendary resistance really castrates this monk ability. However guys, remember, monks can be awesome battlefield controllers with their insane movement speed and a good grapple check (coupled with the "dodge" bonus action for a ki point). Never underestimate your ability to matter to the battle, even though your damage is relatively low. It seems that the greatest use for Stunning Strike is for disabling casters and other low Con, high power enemies. With three strikes, it has a very good chance of single-handedly dispatching enemies and thus preventing covering fire for other enemies. 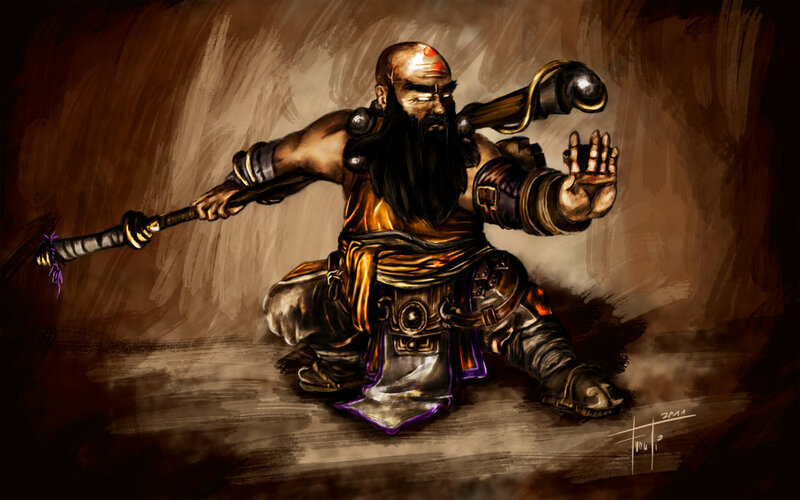 Monks aren't the fantastic DPR, boss-shattering PCs, they are skirmishers who have the right combination of mobility, power, and control to lock down targets that would normally prefer to hang back. Are you going to add the new monk class from the expansion ?